Here in Florida, we’re headed into that time of year when thunder is heard on a regular basis. While most people look forward to spring, and may even enjoy a good burst of thunder, this is not the case for my family. When you have a dog diagnosed with noise aversion, like our Chilly, thunder makes spring and summer seasons to dread. I first learned about noise aversion (also called noise phobia, noise anxiety) in dogs fifteen years ago when my lab-mix, Buck, began to show serious destructive and even self-harming behaviors brought on by his fear of noises — namely thunder. We felt totally helpless as we watched him suffer, and we tried any solution we could think of to bring him some relief. I’ll never forget what Lisa Radosta, board-certified veterinary behaviorist told us about what Buck was experiencing. She said he was literally terrified when he heard thunder. Terrified, similar to a panic attack. Ever since then, I’ve wanted to help people get their dogs help. In Buck’s case, we were eventually able to find a combination of preventative measures and medications that enabled him to live the last two years of his life relatively stress-free. But the meds made him drowsy. As heartbreaking as it was, we learned a lot from our experiences with Buck. So when Chilly began showing signs of noise phobia five years ago, we were a little more prepared. We noticed that his symptoms were usually brought on by audible occurrences, like thunder, fireworks, or the sound of gunfire. (As luck would have it, there’s a shooting range about five miles from our house, so the sound of gunfire, albeit distant, happens frequently). Chilly’s reactions to these noises include cowering, whining, panting, trembling, freezing in place, and hiding. We talked to our family veterinarian, Michael Amsberry, at St. Francis Pet Care Center, and he gave us some helpful recommendations to keep Chilly calm, and he prescribed a sedative, which we used occasionally when thunder was most severe. 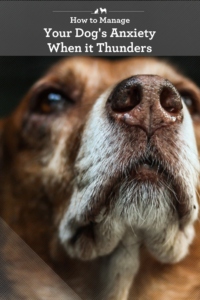 For Chilly, thunder is one of the worst noise triggers. Since thunder in Florida is heard from April through September, it’s a long haul for a pup who’s been diagnosed with noise aversion. Sadly, the condition can worsen for dogs over time, as it did for Chilly. His symptoms escalated over the years to the point where he became destructive. For example, he tried to break through a closed closet door to hide from the frightening noise of thunder. Once in a closet, he would pull down all the clothes from their hangers and then hide in the pile on the floor. At this point, we were seriously concerned that he might hurt himself. So last spring, in preparation for another season of thunder, fear, and anxiety, we visited Dr. Amsberry to revisit how to manage Chilly’s escalating noise aversion. You might have noticed early in this post that I said Chilly was diagnosed with noise aversion. That’s because it’s a real and serious medical condition that can be only diagnosed by your veterinarian. 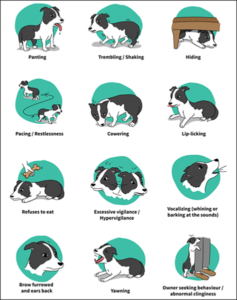 It’s easy to think thunder or noise aversion as a behavior problem because of the associated symptoms, (see a list below). However, it’s the noise that starts the cascade of resulting behaviors. So the key to managing the behavior is to alleviate the fear and anxiety. Over the years, we’ve tried lots of treatments to help our dogs manage their noise aversion. Interestingly, if it’s only raining lightly, Chilly is easily soothed by wearing a pressure wrap like a Thundershirt or by a diffuser that sends naturally calming pheromones into the air. But if thunder is involved, his fear and symptoms escalate quickly. Last summer we discovered something that works incredibly well for Chilly’s noise aversion. I want to share it with you in the hopes it will bring relief to your dog suffering from noise fears. As I mentioned above, several years ago, Dr. Amsberry prescribed trazodone for Chilly’s thunder phobia, but we didn’t really like giving it to him unless the thunder and associated lightning were severe. Because it’s a sedative, it sometimes gave him tummy trouble, and it sedated him to the point where he was basically knocked out. So after sharing this concern with Dr. Amsberry, he suggested we try SILEO® (dexmedetomidine oromucosal gel). 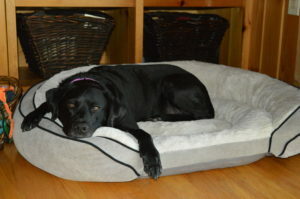 SILEO® is the first FDA-approved treatment for canine noise aversion. It works on its own without any other treatments or behavior training, so it’s a simple approach to treating fears caused by noise. One thing that really appealed to me is that SILEO® calms dogs without sedating them, so Chilly won’t be conked out every time we need to use it. It’s also fast-acting, which is important since we don’t always have a lot of warning for when the thunder will start. 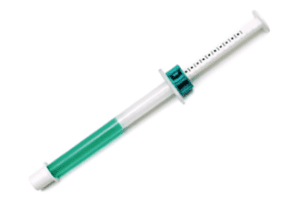 SILEO® is easy to administer using a simple syringe and applying the gel between his cheek and gums. All you have to do is set the dosing ring on the syringe to the correct spot and lock it in place. Then place the syringe between your dog’s cheek and gums and it will be absorbed by the mucous membranes in their mouth. The first time I used it, I watched the helpful videos on this page to ensure I did it right. Always review the instructions for use before dispensing or ask your veterinarian for help if you have questions. For Chilly, SILEO® was love at first dose! After we gave it to him, he seemed relaxed. Since then, SILEO® has become our go-to treatment to manage his noise aversion. We try to give it to him 30-60 minutes before the storm starts to give it time to reach its full effectiveness. The effects of SILEO® last about 2-3 hours, so the storms are usually over well before it wears off. But for those rare occasions when the thunder occurs throughout the day, we love that it’s safe to keep giving it to Chilly every 2 hours, up to five times during the day. We haven’t had to re-dose to that extent yet, but it’s nice to know that it’s safe to do so if Chilly ever needed it. If your dog has noise aversion, you may have noticed that he was behaving strangely, but you might not have realized that he could be dealing with a medical issue. 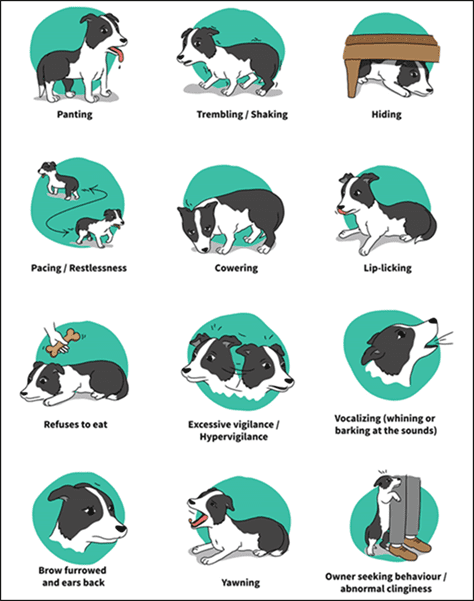 If your dog is exhibiting any of these behaviors as a result of a noise event like a thunder, fireworks, lawnmowers or snowplows, construction, or even the vacuum cleaner, call your veterinarian and make an appointment to talk about it. Use this handy checklist from SILEO® to create a report that you can share with the doctor. During your conversation, be sure to ask specifically if your dog is a candidate for SILEO® (dexmedetomidine orocmucosal gel). This year, Chilly, Paul, and I are ready for the rumbling thunder. If your dog has been diagnosed with noise aversion and prescribed SILEO®, here are my top tips on preparing to weather the season. Keep at least two syringes of SILEO® on hand! Each one contains multiple doses, and they last four weeks from the time they’re opened. You’ll want to make sure you have enough to re-dose your pup in case the noise lasts longer than 2-3 hours. 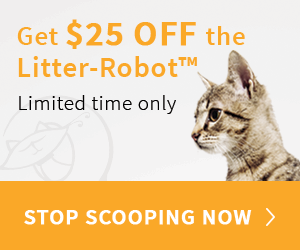 As you use up one syringe, you’ll want to give yourself ample time to reorder from your vet. While some vets keep it in stock, others order it as needed, so there may be a few days waiting time to get your new supply. I like to have enough on hand to last two weeks. Check your weather forecast each morning to determine if and when to expect the next round of thunder in your area. Depending on where you live, you may be able to check less frequently, but here in Florida, I have to monitor the weather daily! The idea is to be able to administer SILEO® either 30-60 minutes before you begin to hear thunder (like we do with Chilly). If it is unpredictable, then SILEO® will also be effective if given as soon as you hear thunder, or when your dog starts to show signs of fear and anxiety related to noise. When should you expect thunder to roll through your town? Click here to check out maps that compare thunderstorm activity around the country. Be clear on the proper dose your veterinarian prescribed for your pet. Closely monitor your pet after dosing, especially after 2 hours. That way you’ll know if you need to re-dose. It would be nice if the only noise our pups had to fear was thunder, but realistically, noise events can occur year round. So, I keep a supply handy for those occasional stress-inducing noises, once the thunder has subsided even. In addition to treating with SILEO®, here are some steps pet parents can take to reduce their dogs’ fear and anxiety related to noise. I’ve been there, so I know how helpless it feels to be unable to comfort a fearful dog. I’m beyond thrilled that we’re not dreading the sound of thunder this year thanks to Dr. Amsberry and SILEO®. If you suspect your dog could have noise aversion, be sure to talk to your veterinarian. Your pet may be suffering when there’s a solution available. Kristen Levine has a consulting relationship with Zoetis.